Believe it or not, gospel singer Kambua has now clocked seven years since saying “I DO” to Jackson Mathu. 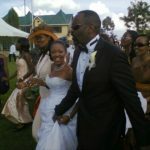 Mathu and Kambua exchanged vows at a wedding garden at the Windsor Golf Hotel and Country Club. on April 7, 20102. It was an invites only ceremony. The two took to social media to celebrate the seven years by giving thanks. “SEVEN…. #GRATEFUL,” said Mathu. Kambua also shared a picture from their wedding and captioned: 1.2.3.4.5.6.7.! @JACKSONMAT. Tough on them The two lovers have been through a lot in their marriage and many Kenyans thought they’d never make it this far. Kambua still doesn’t have a kid and Kenyans have always made her life difficult pestering her with questions why she’s not yet carrying a baby. The post It has been seven years already? Kambua and husband celebrate anniversary appeared first on Ghafla! Kenya.